The new joint American Diabetes Association (ADA) / European Association for the Study of Diabetes (EASD) position paper  published online ahead of print on October 4th now classifies a low carbohydrate diet as Medical Nutrition Therapy. in the treatment of Type 2 Diabetes in adults. What this means is these two organizations which are responsible for educating over 30 million Americans and 60 million Europeans diagnosed with Diabetes consider a low carbohydrate not only safe, but effective therapeutic treatment. This recognition comes on the heels of Diabetes Australia having just released in late August their own updated position paper designed to provide practical advice and information for people diagnosed with Diabetes who are considering adopting a low carbohydrate eating plan . “nutritional diagnostic, therapy and counseling services for the purpose of disease management, which are furnished by a Registered Dietitian or nutrition professional” . That is, upon a review of the most current research, these two organizations have updated their prior position statements and now consider a low carbohydrate diet defined as < 26%* of daily calories as carbohydrate  is suitable for the purpose of disease management of Type 2 Diabetes in adults. *Note: based on an 1800-2000 calorie per day diet this amount of daily carbohydrate would be less than < 113-125 g daily. In fact, the position paper concludes that carbohydrate restriction of 26–45% is ineffective. 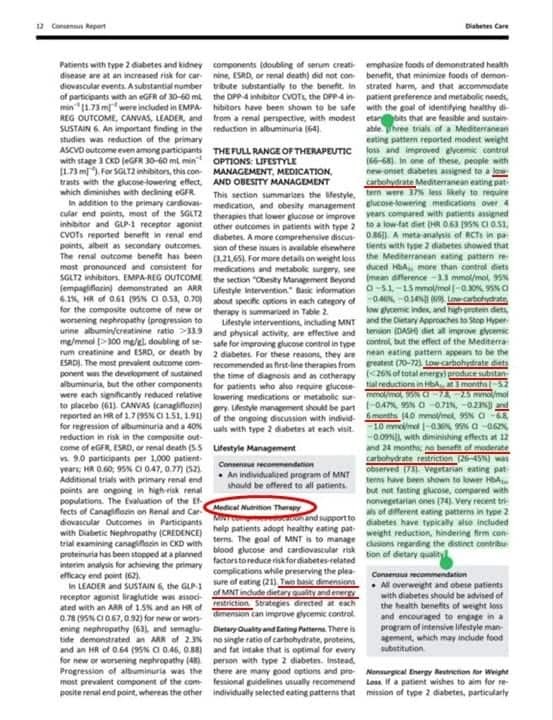 The new joint position statement elaborates that Medical Nutrition Therapy (MNT) is made up of an education component and a support component in order to enable patients to adopt healthy eating patterns with the purpose of “managing blood glucose and cardiovascular risk factors” and “reducing the risk for Diabetes-related complications while preserving the pleasure of eating” . The paper defines the two basic dimensions of MNT as diet quality and energy restriction and outlines the benefits of a low carbohydrate diet in the section on diet quality. Furthermore, the joint consensus paper lists under diet quality (Table 2, page 13) which is one of the aspects of Medical Nutrition Therapy, several diets considered suitable for adults with Type 2 Diabetes, including a low carbohydrate diet. This move has far-reaching significance! Publication of this paper indicates that the current scientific literature supports that a low carbohydrate is not only safe for use in adults, but is also effective in lowering metabolic markers of Type 2 Diabetes, as well as delaying or eliminating the need for blood-glucose lowering medications for up to 4 years . It moves a low carbohydrate diet from the realm of a popular lifestyle approach to Medical Nutrition Therapy. Most importantly, this consensus paper means that qualified healthcare professionals throughout the USA and Europe can now recommend a low carbohydrate diet to their adult patients in order to enable them to manage their Type 2 Diabetes. This is a huge step forward from only being able to provide such a diet based on person’s individual preference to follow a low carbohydrate lifestyle. The American Diabetes Association, European Association for the Study of Diabetes and Diabetes Australia have collectively led the way for international Diabetes Associations the world over to re-evaluate their own treatment and dietary recommendations in light of the most current scientific evidence and update their position statements regarding the safe and effective use of low carbohydrate diets in the management of Type 2 Diabetes in adults. Perhaps you have wanted to follow a low carbohydrate lifestyle and have questions about how such a diet could help you manage some of your clinical conditions or lose weight. Please send me a note using the Contact Me form above and I will reply as soon as I am able. Whether you live locally or away, I provide services in-person in my Coquitlam (British Columbia) office, as well as via Distance Consultation (Skype or phone). You can find more information under the Services tab and in the Shop including the Intake and Service Option form to send in to get started. in Type 2 Diabetes, 2018. 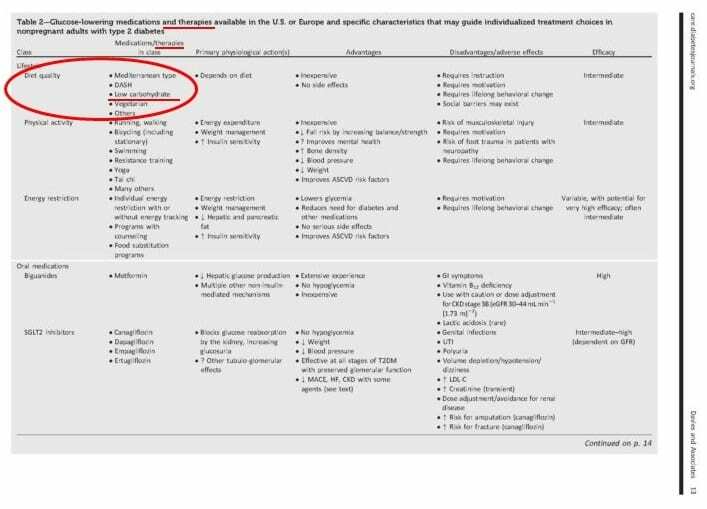 A Consensus Report by the American Diabetes Association (ADA) and the European Association for the Study of Diabetes (EASD), Diabetes Care, October 2018, https://doi.org/10.2337/dci18-0033. Click here for pdf of the full article (on affiliate web page).